Take a 6" x 6" white card base & ink all the edges using Gathered Twigs Distress ink & Stack and Store Daubers. Splatter some of the same ink on it. Take a piece of 5 1/4" x 5" white cardstock & emboss it using Sizzix Tim Holtz Bricked Embossing Folder. 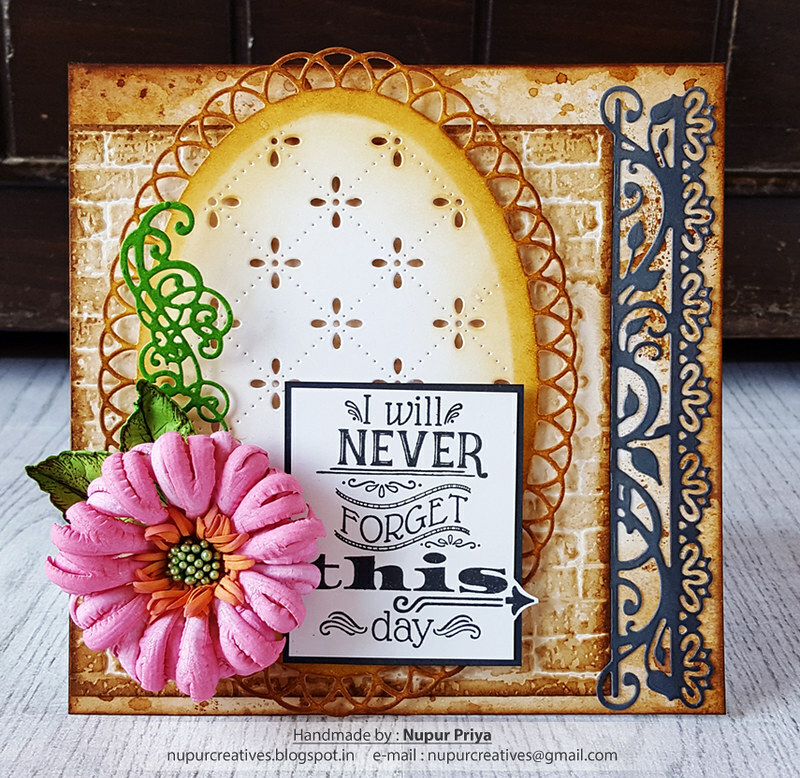 Take another piece of white cardstock & die cut it using Eyelet Oval Die. Ink both the pieces using Gathered Twigs Distress ink. Adhere these to the card base as shown using 3D Foam Circles. Take a piece of white cardstock & die cut it using Sweetheart Borders Die. Cut the die in 2 pieces & use the thinner piece for this card. Ink this piece using Black Soot Distress ink & Distress Oxide ink. Adhere on the card base as shown. Stamp the Enchanted Mum Cling Stamp Set on a piece of white cardstock using Picked Raspberry Distress ink & die cut using matching die from Enchanted Mum Die. Ink it using Picked Raspberry & Wild Honey Distress Oxide inks & Stack and Store Daubers. Shape them using Deluxe Flower Shaping Kit. Stamp the leaves from Open Leaf Cling Stamp Set on a piece of white cardstock using Coffee Archival Ink & die cut it using matching die from Classic Leaf Die. Die cut another piece of white cardstock using the swirls die from Cut Mat Create 2A Die. Ink this die cut & the leaf with Mowed Lawn Distress ink & Stack and Store Daubers. Shape the flower & leaves using Deluxe Flower Shaping Kit. Add some green stamens from Small Pastel Pearl Stamens to the flower center. Stamp the sentiment from Today's Quotes Stamp Set on a piece of white cardstock using Black Soot Distress Oxide ink. Trim the edges & Glue it on a slightly larger piece of white cardstock inked with the same ink. Adhere it on the card front as shown using Darice Adhesive Foam Strips. Arrange & adhere the flower, leaves & swirl on the card front as shown. 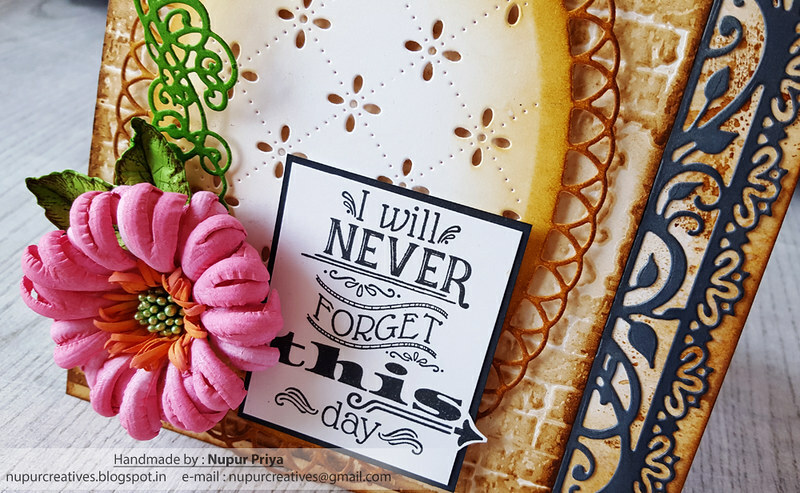 Beautiful card Nupur! Love that flower!